So here’s the super-rad (albeit tardy) giveaway: One 10×20 Puppy Print! Your choice of the two images below. Just leave a comment on this post to enter! Winner will be chosen at 8:00pm this Wednesday, January 26th. These pups are SO cute. I don’t know which I would choose! They are so super cute….makes me want to get another little puppy! Ooh, have loved these pup shots ever since you first posted them so got to post a comment…! Giveaway or not, I’m always hugely inspired by your work and love following your blog. love the 2nd one , but would take either!! all wonderfully done and just want to smell the puppy breath! Awww…little pitbull puppies are my favorite! That’s why I adopted one 4 years ago! He was a little older though, so when I see these beautiful pics I can just about imagine what my 85lb guy might have looked like! Love these. I guess it would to stay in my office, so my dogs don’t get jealous! I love the second one, it’s so adorable!! Love these cute shots! I would totally give it to my adorable nephew if I won. He loves puppies! Thanks for the chance to win! Great work!!! I love these puppy pics! I ordered one, I would live to get the other one. Awesome photos! My niece would LOVE either of these!! Your puppy prints make me smile every time I see them!!! Who can enough of puppy pics? Not me! Enter me please! That bottom one is hilarious…that one little pup must have insomnia…haha. Cute, Cute and Cute! 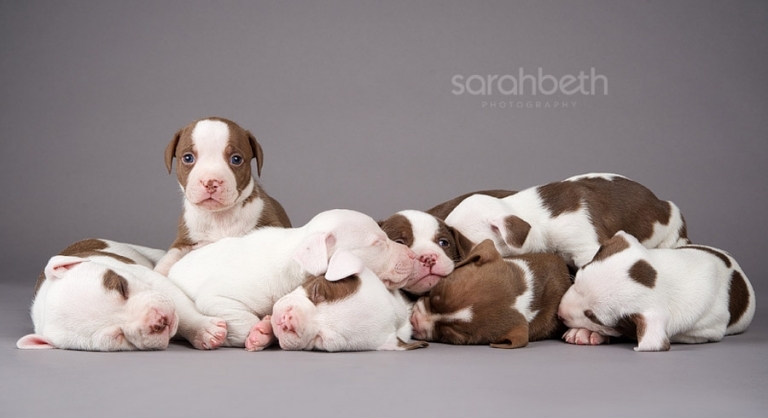 Piles of precious, pudgy (pibble?) pups. Yay! Those are so cute Sarah! Good luck everyone!! Pitty puppies are so cute!!! Showed these photos to a friend and she was taken over from all the cuteness. She has a pit named Nina. Those blue eyes are so hauntingly beautiful – I woul love to be in those puppy piles! I fell in love with your photography the moment I laid eyes on your work! There’s nothing like a sleeping puppy … or puppies breath! Nice job!! As a dog/animal lover it is fun to follow your site! Oh my gosh, I remember when my pit Nina was that little, so cute. Awesome pictures! Seriously – sweeties! Your work is amazing and inspiring each time I check back. Way to go, girl. Too cute! Love your work! Pick me!! I love these photos! These are so adorable. I can’t wait until I can hire you to do my babies. Thanks for all the work you do for SHH. Oh my gosh. Adorable overload. I love your work and this would be so cute in my stepsons room! These photos, and the puppies, are just so adorable. I’d love to have one of your photos hanging on my wall, and be able to stare at these little cuties all day.. just don’t know how to pick which shot, coz I love them both! A print of these adorable pups would be another great addition to the Secondhand Hounds office walls!! :) Enter me! I’m so glad I don’t have to live in state to enter ;) Absolutely adorable photos! I always enjoy your work. Those puppies are the CUTEST!!!! Great photos! I love your work and check your blog frequently for new posts! Ooh pick me! Love the puppies! Adorable Puppies!!! Anyone who ever says pit bulls are mean should be shown this picture :). Quite amazing how you were able to capture these beautiful puppies!!!! Yup. This confirms it. You are my hero. Oh, pitty puppies, you make me smile. And thank you Sarah for posting the link to the Vick dogs video. Nothing like some adorable photos and an inspiring video to help change the stigma of the breed. You are the best, Sarah Beth. I get sooooo many comments on Stella’s pictures! Thank you, Sarah. Your work and commitment to your community are inspiring. Your photos are amazing. These babies are too cute for words. What great photos! These rescued puppies are adorable – capturing one is tough enough but you were able to catch a crew being cute all at once! Your work is amazing. I <3 you and all that you do. These pups would look fantastic on my office wall to cheer me up through Seattle gray skies. I love all of these puppy pictures. I can’t wait to see what you post next! Puppy breath…never can get enough of it! This pic would look great in my new house! I’m voting Team #2! Love the second picture! I really want to dive right in to that pile-o-puppies! Cutest ever!! You are a Facebook marketing genius. 1,000 will be no problem. Love the blue eyes in the puppy in the second photo. Yay! I love giveaways. And it doesn’t get much better than awesome puppy portraits. Awwww…these puppies get me every time I see them…they are sooooo adorable!!! Love it!!! Your pitcures are just super really love seeing new work from you and there ain’t nothing cuter than bullbreed puppies!! Someone is going to have to make a tough decision! It has been said before..but these pups are the sweetest…great work!! I’d love to put one of these pictures in the future baby room in my house! You have such a talent Sarah! Puppies are miracles with paws! This would look great in the SHH office! If I win I will donate it to them! Over here!! Wait.. no down here. close.. yep there you go. ME ME ME PLease!! I need to spiff up my walls! Thank you for sharing your gift! These are both beautiful and so fun! You are right, there was magic in your studio when you shot these pups. Wonderful work! Love the consistent relaxation I see in the animals in all your shots (except for the chickens, but I wouldn’t know chicken stress if I saw It!) What camera and lens did you shoot these with? Oh if only I could be this cute! The joy of puppies is priceless! Please, oh please! LOVE both of these, it would be so hard to choose! Adorable. :) I heart your work! Okay, I know I already commented, but I just have to say again how amazing your work is Sarah, and these puppies are just stunning. Your ability to capture a moment of their emotion is just wonderful!